There is evidence that bees can see many more colors and shades than we humans. Research has documented that honey bees see in the higher ultraviolet range but not so much in the lower red range. This would put yellow and green into their color range, no surprise there. As this spring has progresses, the sensory overload of bright colors and multiple shades of green abundant in nature, has been truly amazing. I look for this each spring and missed seeing the early blooms, usually bright white, on the green background last spring when late frosts and heavy rains in May shut down the show. As if nature had also missed the show, this year’s explosion of shades and colors has been led by locus and cherry trees. These blooms have started to fade by now but are replaced by yellow tulip poplar blossoms. For me, more into blooming plants and less into one shade green lawns, the multitude of flower blooms carpeting open spaces has been a treasured addition to the back ground of tree blooms. The bees seem happy with all of this, building new comb on the foundation in replaced frames, filling the comb with nectar, pollen and larva and flying back and forth shuttling the bounty of spring. I made lots of splits this spring in an attempt to hold swarming down to a minimum. I captured a small swarm from someone’s back yard, started a three section queen castle with swarm cells and like the bees, have been shuttling empty supers to the bee yards. I visited friends over the weekend, staying in a carefully controlled, manicured lawn, housing complex. All the lawns were the same shade of dark green; all the flower beds had the same plants. The sidewalks were empty, the window shades were drawn. There were no bees. I started a small two hive training yard in partnership with my bee club and the farm’s management team. It like beekeeping, will be a learning experience for me as the mentor and for any beekeepers that wish to participate. The plan is to use the hives as a hands on training lab where the farm’s open space and bounty of nature can be a motivator for beekeeping in a more native environment. 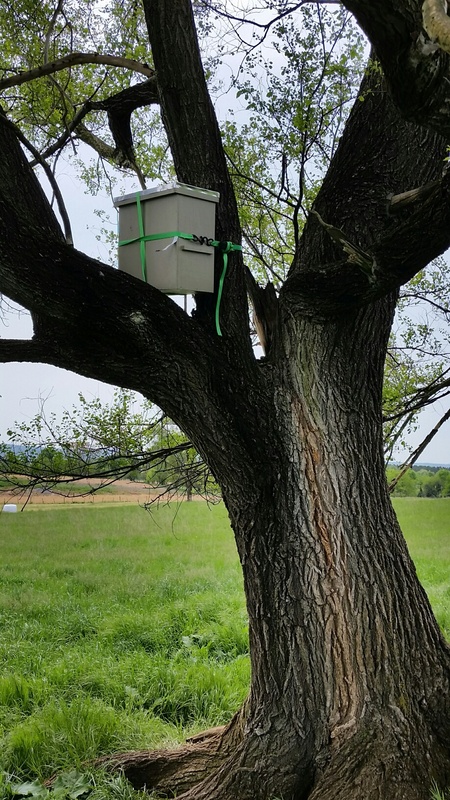 Always hopeful, I installed a swarm catch box.